Chinese MSA finally released list of approved OSRO for class I and class II. These two classes cover almost all tankers and dry cargo vessels larger than 30000GT. Vessels calling Chinese ports after 1st of January 2012 should have a signed contract with one of the approved SPORs. 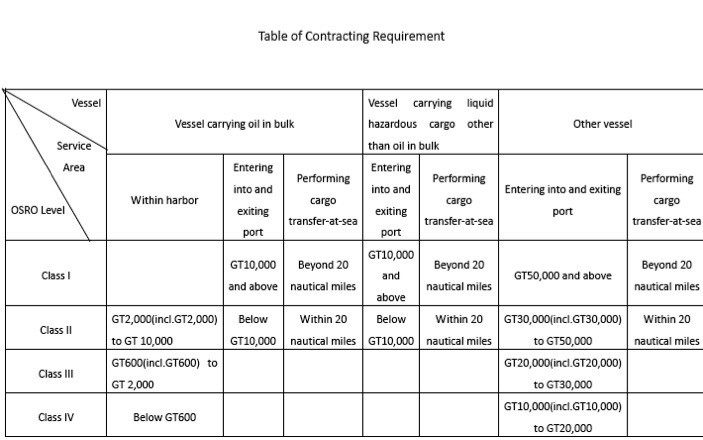 Vessels calling Chinese ports after 1st of January 2012 should have signed a contract with an approved Spill Response Organization SPROs as listed in CMS newsletter N.6 dated 8/12/2011. The list included only class I and class II SRPOs. The following table illustrates the corresponding class to vessels relative their size and type. Operators not based in China can take steps to enter in to a contract with local SPROs through a local law firm, ship port agents or any other legal entity in mainland China or Hong Kong. A letter of authorization must be signed between two parties that will allow vessels agent to negotiate with potential SPROs. In the following links you can find a Sample Contract Agreement and a Letter of Authorization as prepared by International Group. Finally we strongly recommend to contact your P&I club for any further clarifications.